The cows of Udaipur have gone crazy. Last Saturday, Meropi and I did a photo workshop. There was a young cow and it was milling about where we were. We had passed the cow and continued to an intersection where we turned up another street. We had walked a little way up the street and stopped to take some photos. I see the cow coming down the street. It was acting a little crazy and had a particular idea about where it wanted to go. The cow wanted to go up this side ally. There was a woman standing there. She was trying to say out of the way of a man on a motorcycle. The man was parking the motorcycle right in front of the entrance to the side ally. The woman had to go around a motorcycle to protect herself from the cow. Once the man got off his motorcycle the cow barreled through, running full speed down the side ally. The cow almost ran a man over. It was quite a sight. Yesterday, we were doing another photo workshop. In a local market there were three cows standing together eating. Two black ones and a white one. The bigger black one looked at us and started blowing air through its nose hard, making a sound, like it wanted to charge us. It was crazy. A man got in between us and the cow. We walked up the road and got some chai. As we were siting drinking the chai, we look up and the cow is right in front of us. A man got it to go back down the street a little, but the cow turned around and was just watching Meropi. She antagonized the cow. She was talking to it, “My name is Meropi, come and get me.” So funny. The cow came back up the street. When we got ready to continue walking a man got in between us and the cow so we could pass. I think the heat is getting to the animals. They are going nuts. I hope we do not run into this cow again. I do not want it to hurt anyone. I have not written in this blog for a while. But here I am trying again. Oh man, it looks like I made a post on December 1, 2015. I forgot. In that post I mentioned that I was going to return to India for a longer period of time. Well, here I am. I have been in India just over six weeks now. I have been in Udaipur, Rajasthan for just over five weeks. Transitioning to life in India is difficult. I have always lived in the Dallas/Fort Worth area of Texas. Here I am 34 years old and move to India. Many things have been happening to me since I got here. Some of the scenario’s are fun, some sad, some ridiculous. I like to write, so I thought I would share my stories here (or try to anyway). I also have a more academic blog, southasianphoto.com. I am currently failing miserably at that blog as well. It takes a lot of time to write articles there because research is involved. This might be easier as it is free form. Today was nice. I primarily helped a friend, Meropi, with her website. She has to go home to renew her visa next month and she is leaving me to work in her coffee shop. So, I also had a coffee making lesson today. The website was kind of a pain. The company that she uses to make the site is much less user friendly than wix, which is what I use for my artist website. For dinner we headed across town to a restaurant called Zucchini. It is an Italian restaurant. That’s right Udaipur has a proper Italian restaurant or so they want you to think. We got there with no problem (as trying to find places can be difficult here). We walked inside and the decor was not exactly Italian. It was a cool contemporary space. Dark wood, black table tops, white dishes, and minimal buddha and lotus flower cutouts on the walls. The menu offers Italian and Indian of course. We ordered Italian as we have Indian often, as I am sure you can imagine. For starters, we got fried mozzarella sticks and ricotta and zucchini balls (these were fried as well). It was obvious from the start that these items were straight from the freezer but we gave them a try. The were not terrible but they were not good either. But the cheese was in fact melted. Furthermore, here in India you can not find a variety of cheese. They have one kind, Amul, and it is a white cheese. I was excited just to have some other kind of cheese, I did not much care if it was from the freezer or not. For the main course, we ordered a margarita pizza and spinach cannelloni. Again the cannelloni was straight out of the freezer. It was not so great. It had to much spinach and not enough cheese or sauce. The pizza was the best part. It had thin crust, which is what I prefer, not to much pizza sauce, plenty of cheese and a tomato slice on each. It also had olive oil on it, which we do not do in the United States. To drink we had water and a beer. Beer is not on the menu, so clearly they are not supposed to be selling it. But hey, we are foreigners so who are we going to tell. Meropi and I discussed the food during and after eating. She is from Greece, so she is neighbors with Italy. Obviously, the food was not up to her standards. I worked at an Italian restaurant back in the States and the food is not up to American standards either. However, I can give the restaurant a little slack. It is an Indian run restaurant and India is not known for showcasing other countries cuisine. We left the restaurant and got a rickshaw back home. The night was pleasant, nice breeze, nice temperature. I saw a little of the city I had not seen before. I really do love India at night. It is calmer and the breeze carries the fantasy of India on its current. Now I am home writing this post wondering what adventure tomorrow will bring. A little over a month ago I came home from a trip to India, Nepal and Italy. I was in India for an artist residency. I was supposed to spend a month in Udaipur, Rajathan to make art. Which I did, and you can read about making the art on my other blog, southasianphoto.com. However, during that month I also made many friends. One special person in particular who proposed a business opportunity to me. So this April I am going to move to Udaipur. This is crazy. Actually it is a dream come true. For about the last four years I have been plotting to live somewhere besides the United States. My first choice of countries was and is India, as it is my first love. However, I did not think I would be able to move to India. So I am delighted. It is perfect because from India I can pursue my art and my passion for South Asian photography. This blog is just sort of a journal, however, my other blog is more serious in terms of my desire for the content to be a meaningful contribution to the knowledge of South Asian photography. I am hoping that from India I will have more opportunity both in terms of material and time to make that blog a success. Perhaps this one can be more successful as well. As this one was originally intended to document my travels to South Asia. However, I did not make a single post when I went to Bangladesh back in January and I made a conscious decision to make blog posts on my other blog during my most recent journey. I go through phases where I will journal and times where I will not, so as the move to India comes ever closer I am hoping to make using this blog as a journal a regular practice in my life. This way I can continue blogging about my time in India and my travels through South Asia while I am there. Everyday my thoughts are consumed with things surrounding the move. People in Udaipur, people in Texas, all my stuff that I have to sort through and get rid of, my poodle dog and every other thing someone deals with when they are moving. I guess that is all for now. Until next time….. I am so excited that this morning I was able to purchase my train ticket from Udaipur to Agra! Finally I will see the Taj Mahal and other monuments in Agra. I purchased my ticket through cleartrip.com. You have to set up an account with the Indian Railway. You will have to email them, but they were prompt in there responses and everything worked out. To get precise details on how to set up an account with the Indian Railway checkout seat61.com. I am pretty sure I bought the first ticket as I am in seat 1. I got a Tier 2 seat. That means There are 4 beds in one compartment and there curtain dividers. It should be a good time as it will be my first time on a sleeper train! I spent the afternoon making sure I had everything together to send in my Indian Visa application. I am going to mail it all off tomorrow. This will be my third trip to India and the third different company I have dealt with in getting a visa. First, I used Travisa. It was great! Everything work exactly as it was supposed to. Second, back in 2013, the Indian government took on the challenge themselves. It was a nightmare. You could not get in touch with anyone. You called, no one answered and their voice mailbox was permanently full. After they had had my passport about 5 weeks, I finally got a hold of someone who told me that I had not provided return shipping. However, I had provided it, it was in the same parcel as everything else. I was told I could mail new return shipping or come pick it up in person. I drove down to Houston about a week before I left to get my passport. When I got there I found out I needed a copy of my drivers license, so I had to go across the street and get it as they apparently did not have a photo copier there. Seem strange. Back I went. I took a seat. One of the female employees went into another room and got a bundle of passports. I sat there sweating as she handed one to everyone else. She finally handed mine to me second to last. Relief flooded my body as then I knew I could go on my trip!! Now there is another company in charge. Seems good so far. I was able to pay online so I did not have to mail a money order. The paper work was easily accessible and I could pay online for return shipping through Fedex. So I am praying that all goes smoothly. Another thing that was new, is now you can only apply for a ten year multiple entry visa. That is fine I guess as I wont have to apply again for awhile, but my passport expires in four years. Every time I apply for a visa I get nervous. What if they wont let me in!?! I am sure it will be fine. I will let you know when I get my passport back. It has been awhile since I have posted to this blog. The Dhaka/Istanbul trip has come and gone. It was an amazing experience. As soon as I got through security at the airport in Houston the sole of one of my shoes came off, leaving me with only flip flops. It was cold in Istanbul so my feet were cold, but other than that an amazing experience. Istanbul is beautiful and clean. We stayed in the old part of the city a few blocks from the Hagia Sophia. As someone passionate about art I was super excited to see the Hagia Sophia. Our first and only night we (my mom and I) went out for a traditional Turkish dinner which was tasty. They we had a look at two oblisques which had been brought from Egypt at some point. In the early morning we were awaken by the call to prayer. It was very beautiful and moving. Breakfast at our rooftop restaurant was fantastic. We could see the water of the Bosporus and the cheeses were amazing! We headed out early just to look around. A carpet seller tried to trap us, but he didn’t. First we went in the Basilica Cistern, which was built by the Romans. It was peaceful. As we were early there weren’t many people and it was great. 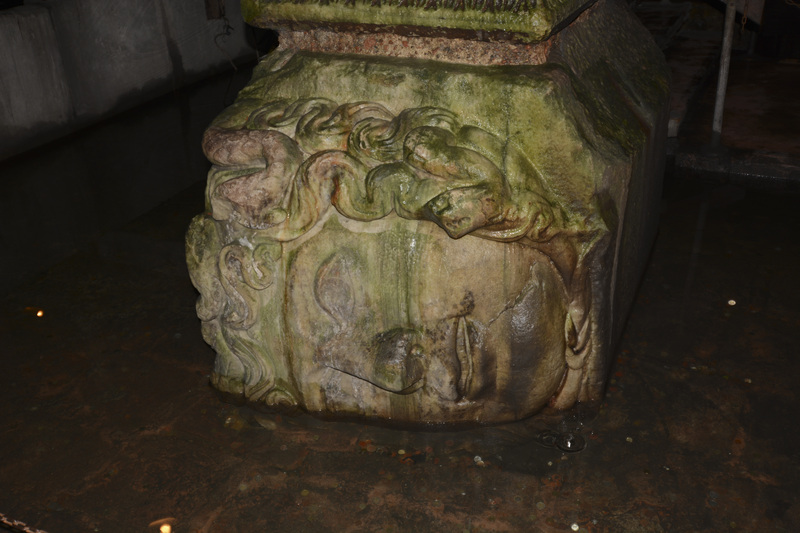 It is know for two of the column bases made from Medusa heads. We checked those out and got our photos in and slowly headed out buying some souvenirs on the way out. Next we went to the Hagia Sophia! It was impressive. The structure is massive and you can feel the history. We got there at the right time as there was no line. Once inside we marveled at the height of the ceiling and the mosaics. You feel the history and the past people as you walk up to the second floor. 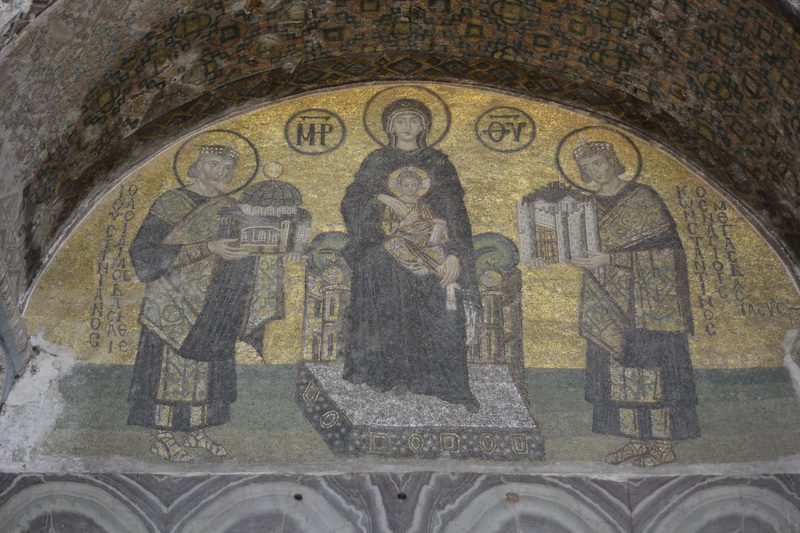 There you can get right up close to several Christian mosaics. After some time checking out the building we headed back out, as we only had about four hours to check stuff out. 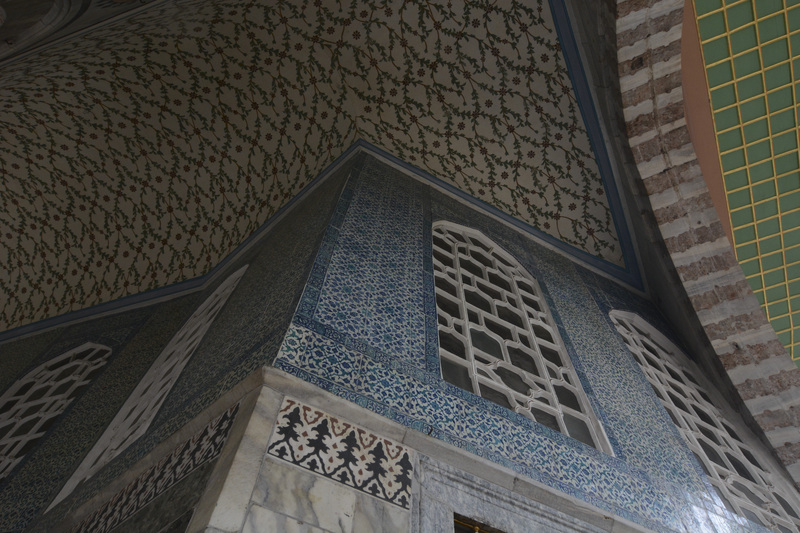 From there we went to the Topkapi Palace. The Topaki Palace was super cool. It is the first palace I have ever been in. The architecture was cool and so were the artifacts. While there it started raining and all the walkways were made of marble stone. Good times for me. After almost falling a dozen times we made it back to the hotel and headed to the airport. Next stop Dhaka. We got to Dhaka early. Getting our visa was interesting as they wrote everything down in a ledger, no computer. Once we got our visa and made it through customs we got a taxi to the hotel. It was good to be in Dhaka as soon as we got there the humidity and smells of South Asia hit you. The strange familiarity was comforting. We got checked into the hotel and then got ready for the day. No nap. We were meeting with a tour guide that morning. He called when he was supposed to be arriving and arranged to be there in two hours. We waited. When he showed up he had a driver which turned out to be amazing. We headed out of Dhaka to Sonargaon the former capital of the area. 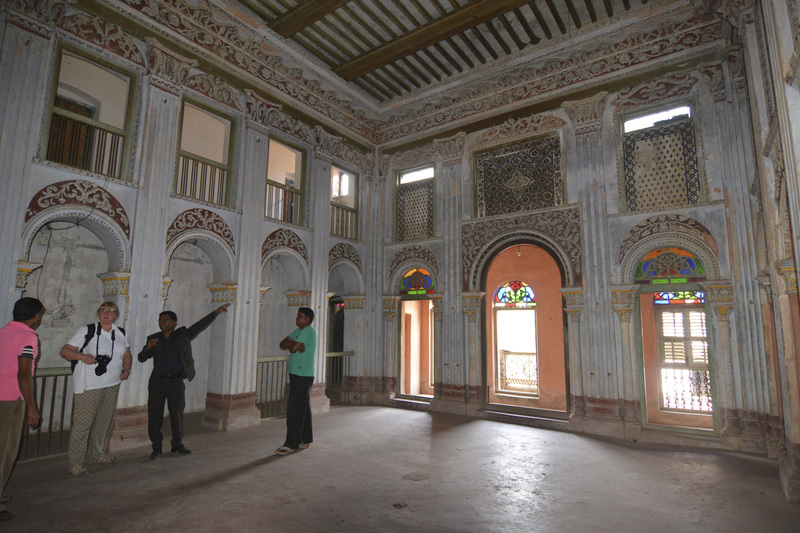 In Sonargaon there is a Folk Museum and some cool old architecture. There was a festival going on a the Folk Museum. That made for a festive atmosphere. There were a good number of people there and I was like a famous person and the teenage girls and families wanted to take photos with me. It was super fun for me. I think the guide thought I didn’t like it. But what they hey, it adds to the experience for everyone. Out on the grounds we got to see regional crafts and tried some fried foods. Then we checked out the old architecture. We paid some baksheesh and got to go inside some of the buildings. One had an amazing ballroom with stain-glass windows. None of my photographs do it justice. We continued down the street and then went to another area where there was a former minting plant (where they used to make money). It was cool. 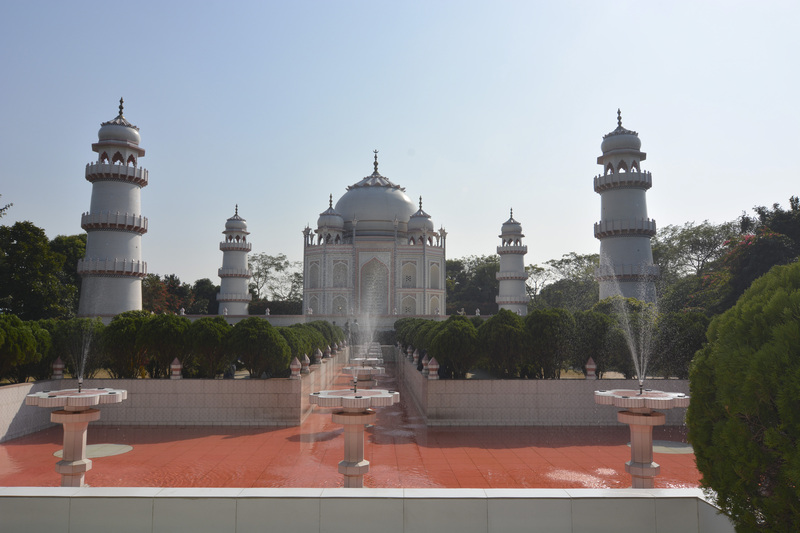 We left there and headed back toward Dhaka but took another side trip to a replica of the Taj Mahal. It was a peaceful place. Not many people were there. The structure isn’t that big and is made of tile. It is beautiful in its own right. We had lunch there, chicken biryani. Back at the car there were two cute puppy dogs! I photographed them but did not touch them, you can never be sure. Our next stop was a place were they make a very intricate loosely woven fabric called Jamdani. The piece I bought is now hanging on my dinning area wall. We got to go in to the small factory area and see the people working. I was extremely tired and I was not sure how I felt about being there. The workers were very friendly and seemed genuinely excited for us to be there. They made my mom and I bracelets out of the string. Then we went inside to the showroom and the men took out and unfolded an overwhelming amount of fabrics. I was too tired to do the math to figure out how much stuff costs, so my mom and I each bought one piece of fabric. My fabric is white with gold accents. My mom’s fabric purple with silver accents. Once we left Jamdani shop we headed back to the hotel and experienced the crazy Dhaka traffic. You can’t explain the pandemonium of vehicles and people and time it took to get across town, you just have to go experience it yourself. Once back at the hotel we had dinner at the hotel restaurant and headed to bed. There are only 21 days until I leave for Dhaka! Today I performed a trial pack of my backpack. Everything seems to be in order. I purchased a new camera since it was on sale. 🙂 My background is in photography and I want to be able to take great pictures. My new camera, 3 lenses, spare underwear, socks, a scarf, Kindle, journal, Lonely Planet guides for Bangladesh and Istanbul, chargers and power adapters are all in the backpack. Oh and a travel pillow that can go around your neck or can be made straight for lower back support. I believe snacks and toothbrush are all that need to be added. There should be plenty of extra space in my bag. I do not like taking a lot of cloths. I prefer to buy them when I get there. I like South Asian cloths and I am excited to buy my first sari with my mom! I still have to figure out what I am going to wear exactly in Istanbul. I do not want to carry a jacket. All I need to buy is mosquito repellant, aspirin, and pepto-bysmol (just in case). Today I finished reading a book, Culture Smart! Bangladesh. It was a nice easy read about the history and cultural norms of Bangladesh. Somethings like eating with your right hand are the same as in India, so I should not have a problem. Other things will be new. It will all be new to my mother, so this will be a fun adventure.